In our current state, our patients and their families sometimes must walk lengthy distances from our parking garage to the emergency department. The parking garage is located on the southeast corner of the campus and the emergency department is located on the northwest corner. While we offer valet parking services, the lack of available parking near the emergency room continues to be a challenge for our patients and their loved ones. During what is already a stressful situation, this lengthy walk is especially challenging for loved ones who are seniors or who are in poor health. When you are dropping someone off or coming to meet someone you love at the emergency room, you are in a crisis moment. In our current state, there is not an intuitive, convenient and easy place to park. If you drop someone off, it will take you a considerable amount of time to drive down Jefferson Highway to the parking garage, park and walk that distance through the hospital back to the ER. That’s time you are not with your loved one while they are being triaged and taken back to an exam room. This is especially difficult for families bringing children to the pediatric emergency department. This project is designed to meet the needs of our patients and their families. Durr Heavy Construction are the contractors for this project. Work is scheduled to begin in early August and will conclude in late January. Working hours will be between 7:00 AM and 5:00 PM Mondays through Fridays with occasional Saturdays. During the demolition and construction process, we will work to minimize the impact on the neighborhood. If you have any concerns that need to be addressed during the construction of this project, please contact Ochsner Facilities Development at 504-842-3677. 11 properties in 200 block of Betz and Deckbar Avenues along the Jefferson Highway corridor that are owned by Ochsner and currently vacant. Approximately 1/3 of the site will be a landscaped green area. The plan maintains 8 existing trees on the site, including all live oak trees. Nearly 50 new trees will be planted. The project will result in a drainage improvement for the area. Compared to the existing conditions, the project will reduce the flow rate of storm water into the parish drainage system by approximately 20%. In keeping with DOTD guidelines, there will be no new turn lanes off of Jefferson Highway. The project provides connectivity between the ER entrance and the new parking area, which will keep traffic off of Jefferson Highway. Security lighting is incorporated into the project, which points down and away from the residential areas. The project includes security cameras which are monitored 24/7. The lot will have controlled access and will require validation. Ochsner updated their zoning request from H2 to a more restrictive H1. 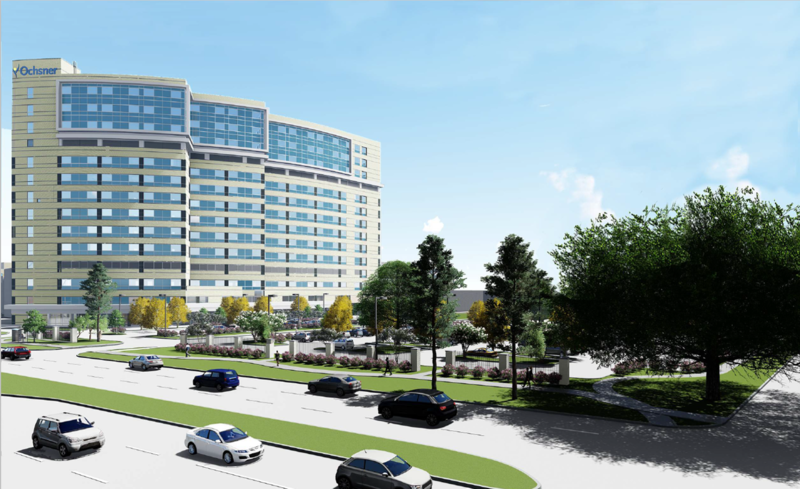 If Ochsner ever chooses to develop anything on this site that is outside of the H1 restrictions, we will go through a public approval process.